We’ve seen reconciliations and great burgers in our time, but no one smashes beef better than Shawn Nee. 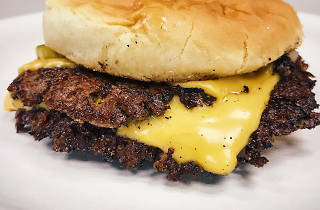 His backyard pop-up, Burgers Never Say Die, reached legend status in fewer than two years, hopping from invite-only grill-outs to pop-ups that drew hundreds of fans hoping to wrap their hands around a stack of smashed-paper-thin beef patties, melty cheese, onions, pickles, ketchup and mustard. Today, BNSD takes a leap into its new home: a counter-service restaurant in Silver Lake—and the lines are forming (so maybe read this on your way there). As first reported by Eater, the doors are now open from Tuesday to Sunday, and while it’s a restaurant, seating is designated to a patio that’s shared with Silverlake Coffee. Yes, there is parking, and no, there’s no limit to how many burgers you can order—great news for BNSD’s rabid fanbase. One woman traveled from the U.K., with the BNSD pop-up on her itinerary as an L.A. must-try; another customer used TaskRabbit to hire someone who’d hold their place at the front of the line—and that hired help wound up waiting three and a half hours. BNSD’s fandom is intense, the stanning is real and the celebrity lure is legendary. A lot of that success is due to simplicity. Nee, a former film industry pro who’s turned grillmaster, is somewhat of a time traveler: An ’80s kid still drawn to analogue, he’s created a burger that’s transportive and of the era. There are no bistro toppings here, no dollops of bone marrow, no squares of ketchup leather—just the basics, like the best kind of burger you’d eat in a car—just one of the many reasons it landed on our Best Dishes of 2018. Like some sort of grill-station Goldilocks, he’s spent the last two years of his life tasting and perfecting the smash burger, testing meat blends too fatty, metal presses too small, and buns too firm. Finally, he’s managed to get them all just right (though it’s hard to believe they weren’t near-perfect enough along the way). He’s on his eighth-or-so version of hamburger buns. The perfectly waxy, gleaming cheese—yellow American—is his sixth or seventh brand. He began with mass-produced metal presses to smash his patties down to thin, crisped discs, only to find they weren’t wide enough. Naturally, Nee had his own smasher made. He realized it was too small. So he had another smasher made. And another. 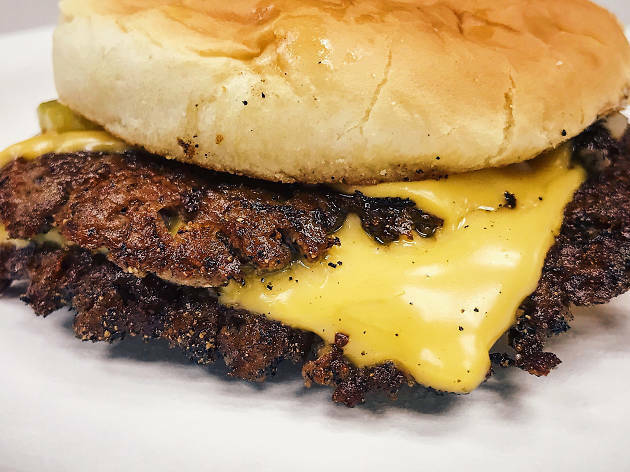 If you look at early photos of the burger, the meat is pressed to only a fraction of the current iteration, and the cheese completely envelops the patties. Now, the beef in BNSD’s flagship item is so flat, it almost dissolves on your tongue, and the cheese is laid just right—exactly the way Nee always envisioned, and without having to trim down the slices with a cookie cutter, the way he used to. In Silver Lake, Nee and his team fleshed out the menu of single and double burgers with tall styrofoam cups packed with French fries; the Grilled Deece, a grilled cheese sandwich with the buns flipped inside-out; and CVT soft serve in chocolate, vanilla or swirl. The goal at the restaurant is to open at 11am and keep serving until the nearby bars close—it’s located next to Red Lion Tavern, after all—but for now, expect limited hours as the BNSD crew find their footing and a natural rhythm with their historically long lines. Burgers Never Say Die is now open at 2388 Glendale Blvd, with current hours of 11am to 5pm from Tuesday to Sunday. Look for extended hours in the near future.